Unfortunately, we live in a dystopian society where “the bottom line” trumps everything and the good fortune of the few entails the subjugation of the many. Every utopia reminds us of its opposite; every dystopia stirs our longing for a better way of life. In The Marshlanders, Clare is savagely beaten while her mother is being shamed at the behest of apothecaries seeking a monopoly on medicines. She is adopted by Marshlanders and thrives in their self-sustaining and altruistic community. Here she is when she has recovered. 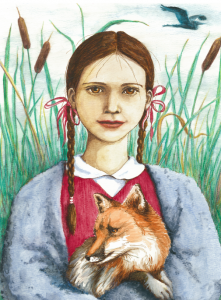 In The Road to Beaver Mill, similarly, Bethany experiences starkly contrasting communities —the hard-hearted, misogynistic settlement of Western Fisher folk, who despise her as a half-breed and work her cruelly; and the egalitarian settlement of Eastern Fisher folk, where she is welcomed and cherished. In these days of runaway profit seeking and environmental degradation I have found enormous solace inventing fictional communities where I would love to live – my Marshlanders are self-sustaining, practical, cheerfully sensual, full of laughter and a down-to-earth kind of spirituality. I have never been far from the dark side of life, however, so I’ve had no trouble imagining the world of enemies who are determined to drain their wetlands for monetary profit.